Grenell has a habit of interfering in Germany's internal politics, his critics say. 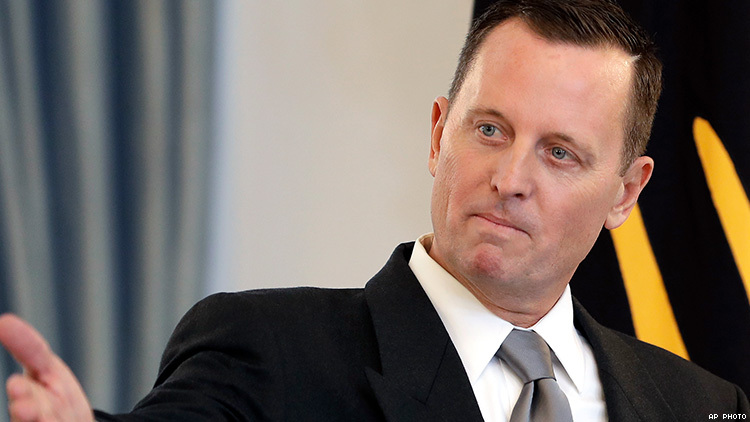 Richard Grenell, the U.S. ambassador to Germany and the highest-ranking gay person in Donald Trump’s administration, is continuing to offend Germans to the point that some politicians say he should be expelled from the country. Wolfgang Kubicki, deputy chairman of the Free Democratic Party, accused Grenell of repeatedly interfering in Germany’s internal politics. “Any U.S. diplomat who acts like a high commissioner of an occupying power must learn that our tolerance also knows its limits,” Kubicki told German publication Deutsch Welle Tuesday. Grenell this week criticized Germany’s defense spending plan for 2020, which falls short of what it promised to spend as a member of NATO. A few weeks ago, he demanded that the nation halt construction of a pipeline across the Baltic Sea to bring in gas from Russia. Carsten Schneider, manager of the Social Democratic Party caucus in Parliament, told news agency DPA that Grenell is “a complete diplomatic failure” who “damages trans-Atlantic relations with his repeated clumsy provocations.” He said Grenell puts him in mind of a “flail,” someone who thrashes about uncontrollably. A further critique came from Michael Grosse-Brömer, a member of Parliament who is part of Chancellor Angela Merkel’s governing coalition. “If one keeps an overall view, many comments made are more coherent than those of the American ambassador, if he thinks he has to comment on something every week,” he told Deutsch Welle. Grosse-Brömer also said Germany’s contributions to international military operations, including those in Afghanistan and Mali, have been significant, so Grenell shouldn’t have an issue with its defense budget. Grenell has a history of offending his host country. Last May, shortly after he was installed as ambassador, he tweeted that German companies should cease doing business in Iran, and some Germans saw that as a threat. The following month he told right-wing U.S. website Breitbart News he wants to “empower other conservatives throughout Europe,” a statement that certain German pols took as interference with national sovereignty. There were calls to expel him then. Grenell, who has worked in the George W. Bush administration and in Mitt Romney’s presidential campaign, wasn’t always diplomatic before he became ambassador either. He has frequently insulted powerful women via Twitter, often commenting on their appearance. He once tweeted that out MSNBC host Rachel Maddow “needs to take a breath and put on a necklace,” and he has criticized the looks of both Hillary Clinton and another former secretary of State, Madeleine Albright. That led to skepticism about his suitability to be ambassador to a country led by a woman. He does have some defenders in the latest controversy. Omid Nouripour, foreign affairs spokesman for Germany’s Green Party, called Kubicki’s remarks about Grenell “plain nonsense.” The ambassador is an important channel to Trump, something that is “needed more than ever before,” Nouripour told the Neue Osnabrücker Zeitung newspaper.